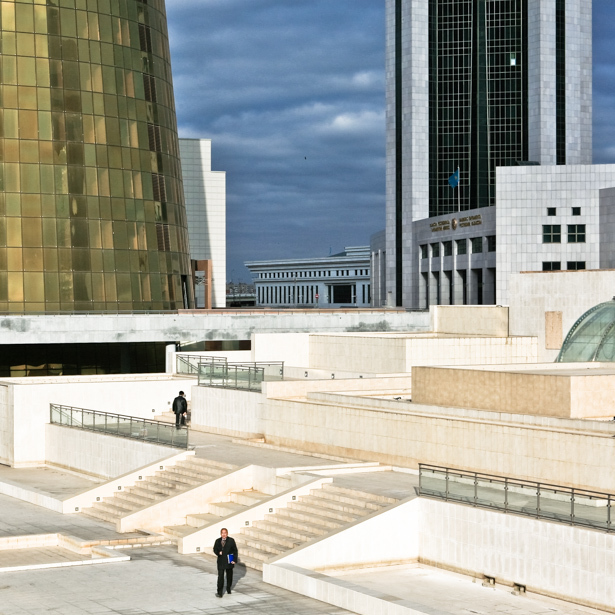 The pictures concentrate on two cities: Alma Ata, the former and Astana the new capital of Kazakhstan since 1997. Alma Ata located on the famous Silk Road developed and grew organically over centuries. We find huge business buildings and modernistic residential areas like everywhere in the world. Nevertheless, investment driven architecture couldn&apos;t completely destroy the character of the city. Astana on the other hand is a green field site founded by its ruler Nasarbajew. There, one luxury building after the other mushroomed up in the middle of nowhere: The golden Twin Towers, copied from Dubai or New York, a skyscraper with a Chinese Pagoda roof etc. The city is an artificially produced mixture of architecture in postmodern style. At the same time in residential areas of Astana normal people have to cope with income levels far below European standard. "The new city", they say without any regret, "belongs to the rich." And it belongs to the powerful. Along the show boulevard Ministries and representative company buildings are planted in perfect symmetry. A light blue cupola crowns the palace of the nearly all-powerful president Nasarbajew, the building looks somehow like White House in Washington, but just twice as big. For the buildings at either end of the axis Norman Foster was engaged. He has put one pyramid into the waste directly behind the palace, a second one right between the steppes and the mosquito ponds has just been finished. There the new Kazakhi man should enjoy himself in a luxury temple for amusements. However this artificial district is still a bit deserted.